German finance minister Wolfgang Schaeuble has said the institutions in charge of Greece’s bailout have reached a “common position” on how to proceed. His comments appear to indicate that deadlock between the EU and the International Monetary Fund over the next steps may have been resolved. 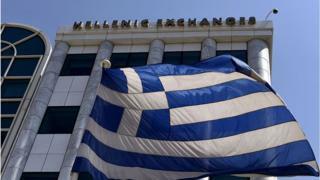 The IMF has said Greece needs more leeway to pay its huge debts before further rescue funds can be released. However, the eurozone has been reluctant to go much further. Eurozone governments have provided some debt relief already, in the form of lower interest rates and extended repayment periods. IMF staff think Greece needs more concessions. However, the Fund has said there was no need for what it calls an “upfront haircut” – a reduction in the principal that has ultimately to be repaid. In another development, the head of the European Stability Mechanism – the eurozone’s bailout fund – said in a newspaper interview that Greece’s finances were improving faster than expected. Klaus Regling told Germany’s Bild that Greece would probably need far less than the agreed maximum loan of 86bn euros (£73bn) by August 2018 as a result. Can you guess on which items we pay VAT?